The evergreen tree at the end of our driveway is in pretty rough shape. It looks like it's dying. We're starting to be concerned about it falling. Thank you for your submission, it has been received as service request #20831. Tree from parkway fell onto street back around thanksgiving. 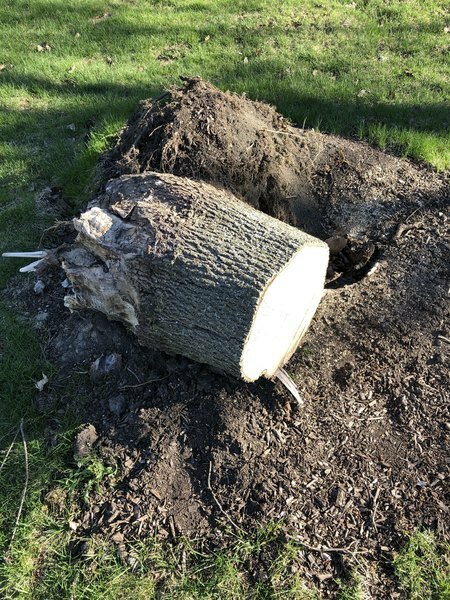 It was cleaned up; however the stump was left. 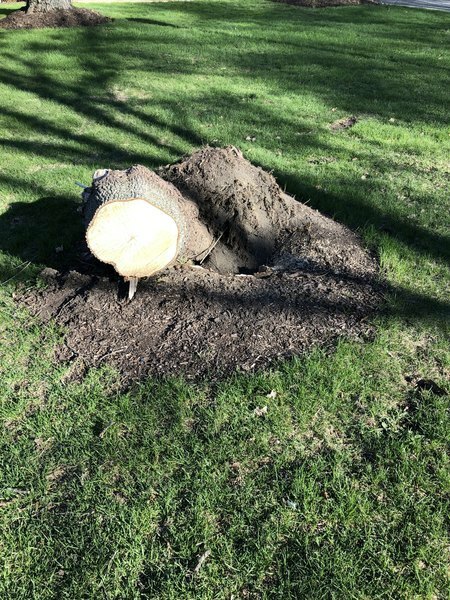 It is uprooted and there is a hole in the ground. I would like it removed and possibly replaced. Thank you for your submission, it has been received as service request #20797. Parkway in front of my house. Thank you for your submission, it has been received as service request #20830. Thank you for your submission, it has been received as service request #20554. Can you please provide an address for the potholes? Hello, Address is 4024 N. Kennicott Ave. Thanks for the help. Thank you for the updated address. The service request has been updated so that the Street Unit can repair the pothole. There’s a few potholes at the intersection of Lake Arlington Drive (LAD) & Hunter and several more along LAD from Hunter to Palatine Rd and Towne Blvd to Schoenbeck. There’s another on Towne Blvd near the intersection of LAD in front of the Clubhouse at 2601 LAD. Thank you for your submission, it has been received as service request #20667. Big pothole/dip in the westbound lanes. I can’t see it while approaching, but it feels like it will swallow my car as I go through it. Thank you for your submission, it has been received as service request #20660. An unpaved alley across the street from our house is plowed throughout the winter. A lot of dirt and rocks end up getting plowed with the snow. The snowplows push it up onto our parkway. Now that everything has melted, there is a large amount of dirt and rocks and debris in that spot. Thank you for your submission, it has been received as service request #19756. On 4/03, I requested that the debris all along Euclid between Waterman & Rand be picked up. The issue was closed by the village but the debris is still there (except the chair cushion - the only thing gone). Just because an issue is closed does not mean it has gone away and is resolved. Garbage strewn along our parkways makes our village look shabby and uncared for. Thank you for your submission, it has been received as service request #20652. Thank you for your report. This section of roadway, including the right of ways on either side of the road, are the Jurisdiction of Cook County and maintained by the Cook County Highway Department. We have previously reported this situation to them on 4/3/19. We will contact them again and inform them that this area still needs additional attention by their crews. The light cycles on and off throughout the night. Thank you for your submission, it has been received as service request #20712. Decorative LED street light at the SW corner of Vail and NW Hwy burned out as I was sitting at that intersection last night. Thank you for your submission, it has been received as service request #20792.